Halloween is a fun time in the City of Avondale Estates. Congratulations to this years Halloween Spirit Award winners! View photos of the winners by visiting the Halloween in Avondale Estates page. 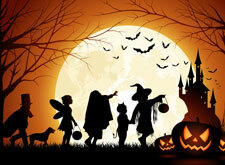 Halloween Night is a busy time in the City of Avondale Estates. To keep trick-or-treaters, residents and visitors safe the Avondale Estates Police Department has developed a traffic plan. The below traffic plan will go into effect at 5:30 p.m. and end at 8:30 p.m. on Saturday, October 31. - Traffic will be one way, southbound on Clarendon Avenue from South Avondale Road to Wiltshire Drive. - Traffic on Kingstone Road will be one way, eastbound from Fairfield Plaza to Berkeley Road, then east to Lakeshore Drive or north on Berkeley Road. - Dartmouth Avenue will be closed to vehicle traffic from Fairfield Plaza to Sussex Road. - Clarendon Place will be closed to vehicle traffic. - Wiltshire Drive will be one way, westbound from Clarendon Avenue to Forrest Boulevard. - Wiltshire Drive will be one way, eastbound from Clarendon Avenue to Berkeley Road, then north on Berkeley Road.